In December of 2012, I wrote the post Cutting Before Sewing. I waxed poetic about my B & D cordless power scissors, now virtually unavailable . And it's true that nothing beats their ease of use for cutting a bulky sweater knit. I particularly recommend the sharp blades of fully charged power scissors to anyone who may have sore, tired, or arthritic hands -- just switch them on and gently guide those scissors. The electricity does all the work. But when I can no longer find the power scissors locally and the online price for these things more than tripled (!!!) and replacement blades for the power scissors are impossible to find, it's time to move on. From the pic above (or if you follow me on Instagram) you know where I've moved -- to rotary cutters. 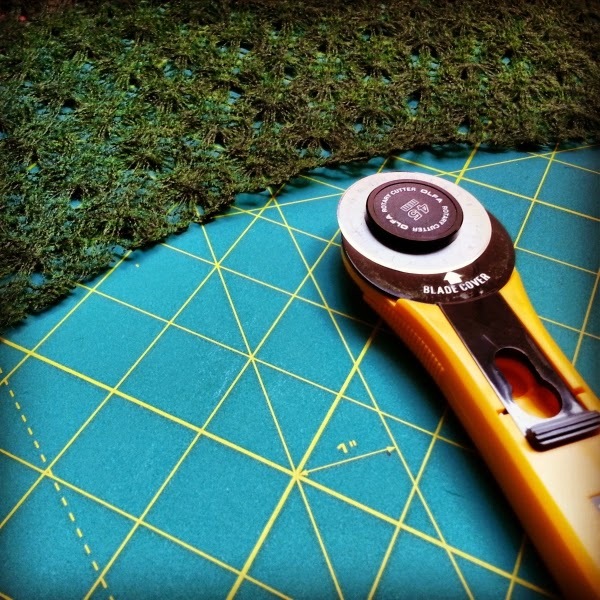 While power scissors required about a minute's worth of "practice" before I became comfortable, I slowly became at ease with the rotary cutter by first cutting straight lines (bands and binding) using my metal edged ruler as a guide. I used a suction cup ruler handle and made sure fingers and thumbs were out of the way. I'm careful to always roll away from my body. Progressing to the curves of necklines and armholes took a little more practice. I moved slowly and was very pleased with the results. What surprised me was that the blade was so maneuverable! Also I needed a lot less pressure than I had originally imagined. Interestingly, I took a Sew a Leather Tote class at Brooklyn Craft Co, last Sunday. I learned that our teacher used a rotary cutter to cut leather. 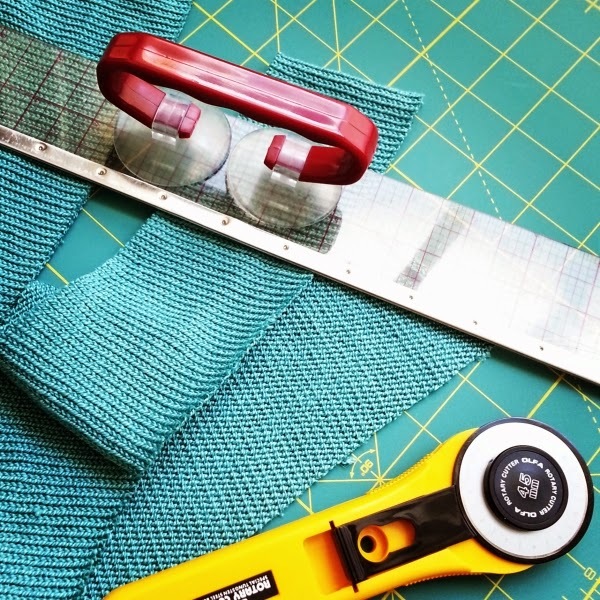 I'm now confident enough that I'd probably go ahead and use a rotary cutter for cutting out a garment of woven fabric too. Why have I feared this versatile tool for so long? The best thing is that I think rotary cutters, replacement blades, and mats will be around for a long time. And there are enough competing brands so that the prices will remain reasonable, I hope. So what are your favorite tools and tips for cutting? Glad you found an easier to maintain replacement for your power scissors!